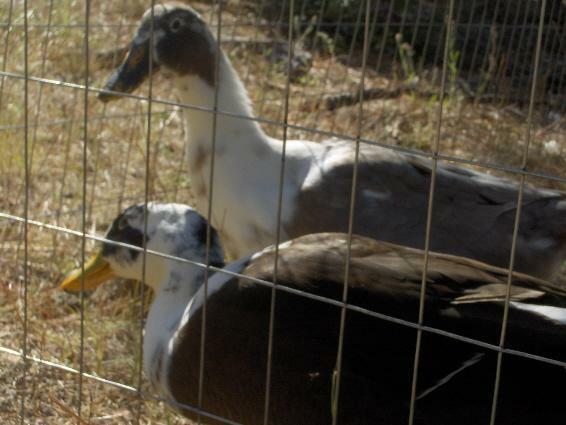 2009 brought on the need for a Quack Academy when 11 wonderful little ducklings arrived from Holderread Waterfowl Preservation Center in Corvalis, Oregon. The crew consists of 5 Ancona and 6 Golden Welsh Harlequins. So work began on the academy. 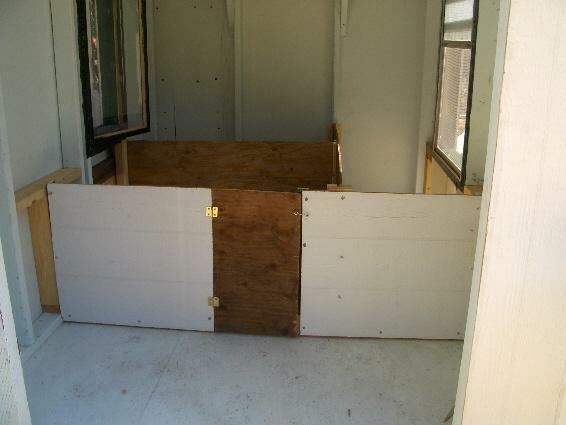 I purchased a wonderfully made 6' x 8' shed and had it delivered to me and the layout and design of the duck enclosure began. The shed of course would need windows so I began looking for windows to recycle to place in the shed, meanwhile, the duckies were sleeping in the garage and spending their days in a large tractor. The inside of the shed was roomy enough that I decided that I would make removable dividers for the interior so during the Spring I could separate my breeding groups. the shed had a wonderful shelf already installed which would make a perfect storage area for DE, extra waterers or feeders and so forth. I decided that I wanted to keep the shed's existing white T-11 siding so I chose a hunter green to accent the windows and so forth, with a lighter pastel green for the interior to lighten the inside up. Painting then began. I wanted a cabinet to store vitamins, emergency items such as gauze and so forth, so I used the existing interior door structure to build a medicine style cabinet. I added a simple plywood door, painted it hunter green and put two hook and eye latches on it. Then I began cutting out the ventilation openings near the roofline by putting two above the door and two about the rear storage shelf. Each ventilation opening was covered with 1/4" hardwire cloth. The windows would be placed on sides. I began installing the windows I had found to recycle. 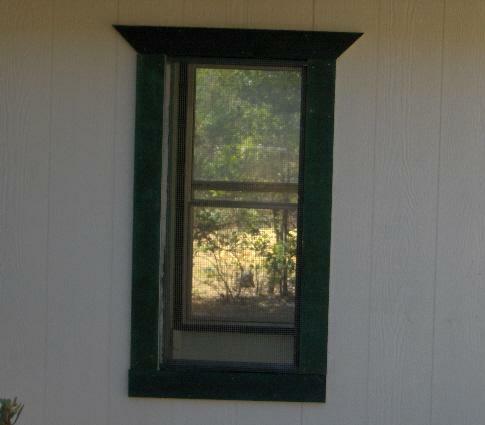 I used 2 x 4's to frame the windows. One was narrow and tall (28"' x 54") whilethe other was a standard slide up with a screen 36" x 48". The windows were placed almost directly across from each other to provide cross ventilation in the summer. The enterior of each window was covered with 1/2" hardwire cloth and decorative molding was cut from 1 x 4's and painted hunter green to cover the hardwire cloth on the outside. 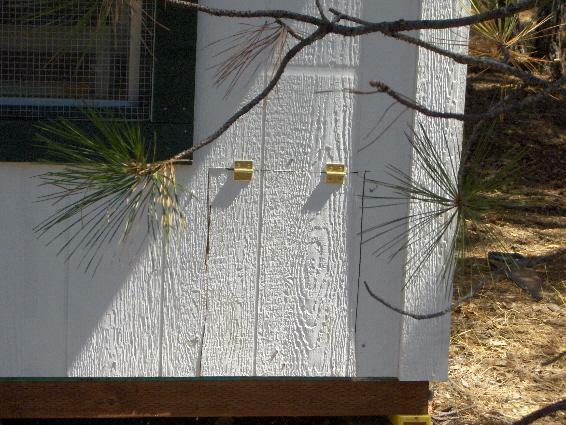 Because of the breeding groups, 3 duckie doors, sized 15" x 17", were cut into the sides of the shed, each hatch to interior latches. 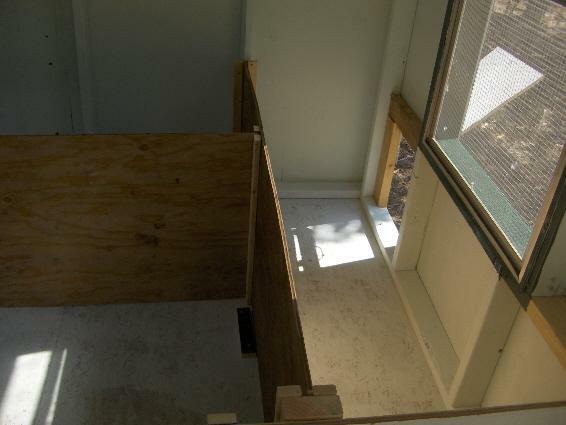 With the T-11 siding, the duckie doors are flush and there was no need for full framing around each, 2 x 4's cut to size were used inside as side frames. 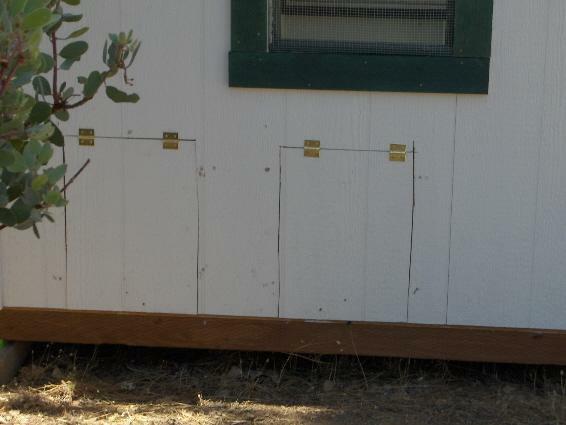 each door has an interior handle and an exterior chain attached so that when they are opened they are held open by attaching the chain to a small hook mouted on the outside of the shed. 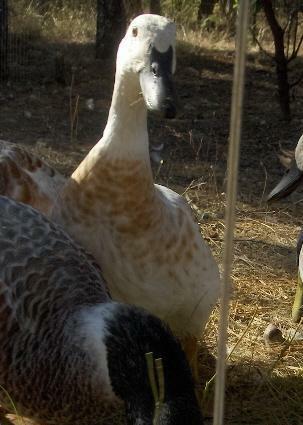 The individal areas for my three breeding groups were made from plywood and 1 x 2s and 2 x 4s. As I have a pair and trio of Ancona, their areas are large enough to accomodate their size. The other section is for a trio of Golden Welsh Harlequins which are smaller than the Anconas. a small hinged door with latches was cut to allow me entry into the areas without stepping over the 2.5' tall divider walls. 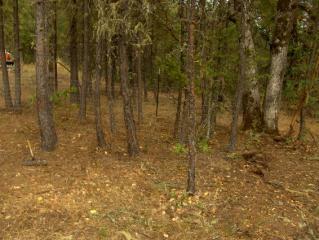 The area in front of the main wall above, is where their food and straw is stored. 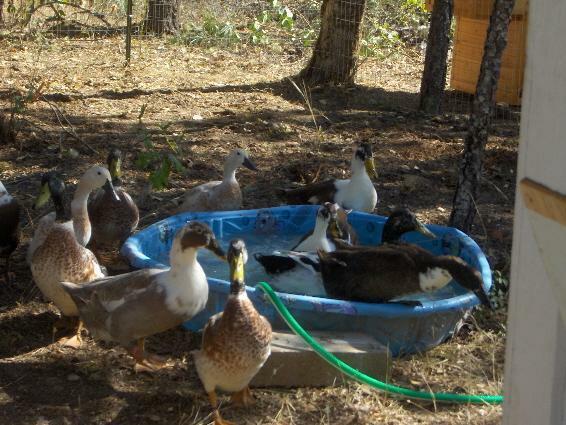 I purchased a 10 x 10 pond liner and put it on the floor with their straw on top of it. 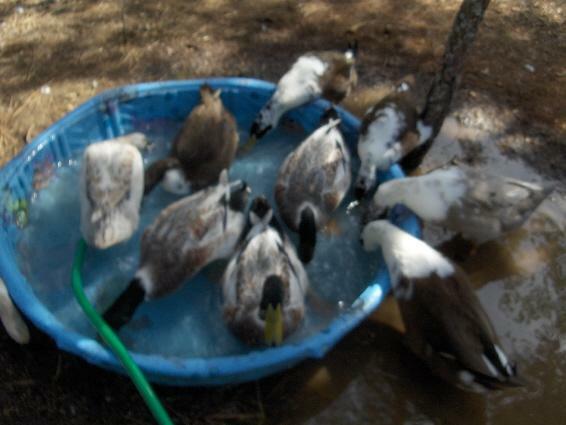 This helps create a moisture barrier between the ducks and the plywood flooring. I installed a double hook from the roof beam to hold a heat lamp, lamp or fan as needed. 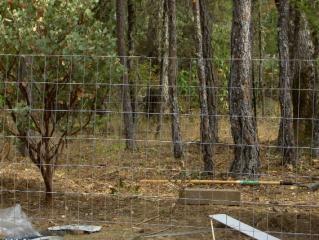 Then I began to layout their enclosure area by putting T-Post in place and using 1" x 1" fencing. 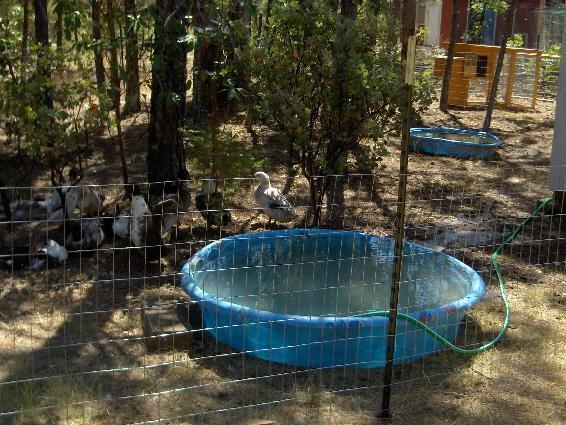 Their enclosure area is approximately 2000 sq ft measuring approximately 40' x 48', the fencing enclosing trees for shade as well as two kiddie pools. One small and one large. 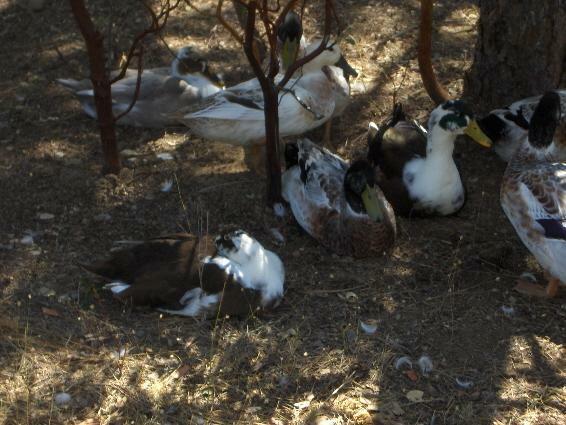 The ducks moved in without the divider walls and love it. 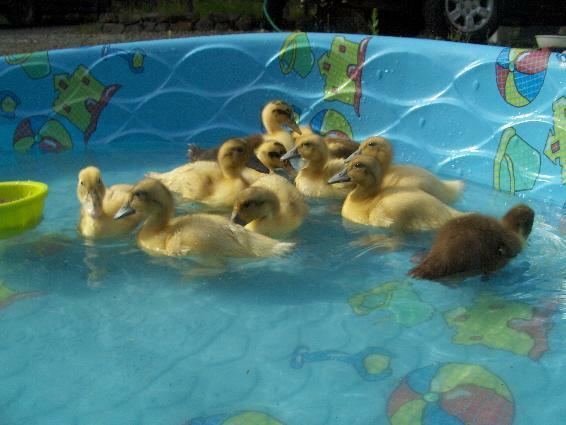 They have their pools, a huge play area that is secure and everyone is happy. 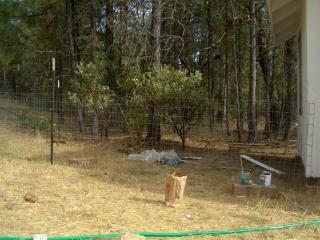 I installed a double layer of chicken wire on the inside of the fencing and ran it under the fence and out about 2" to stop any digging critter. 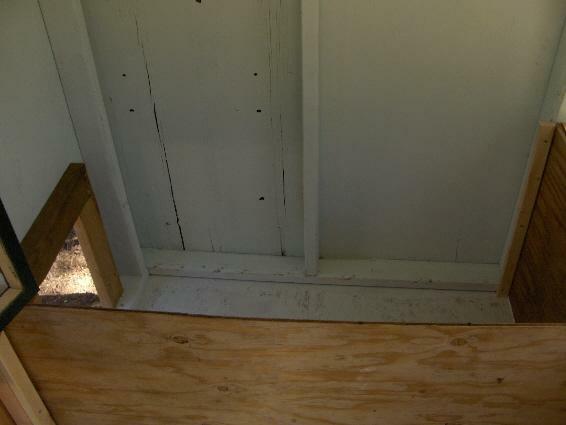 I also drilled a large hole (2") in the side wall near the roof-line to run an extension cord into the duck house. I used a desk cord concealer to close off the hole with the extension cord running inside. It worked great during the summer for their fan and it keeps the extension cord off the ground. 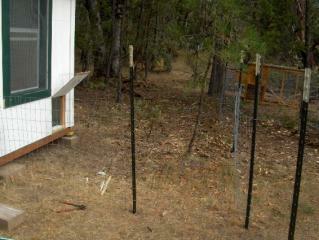 The small coop in the background is in a separate fenced area and that will house my extra drakes in the Spring once it is modified and secured. Or I may build them their very own little house. The trees give them plenty of shade and I enclosed a dense area to avoid hawks being able to dive into their enclosure...there just is not room for a hawk to get in there. The ducks are very happy in their area. 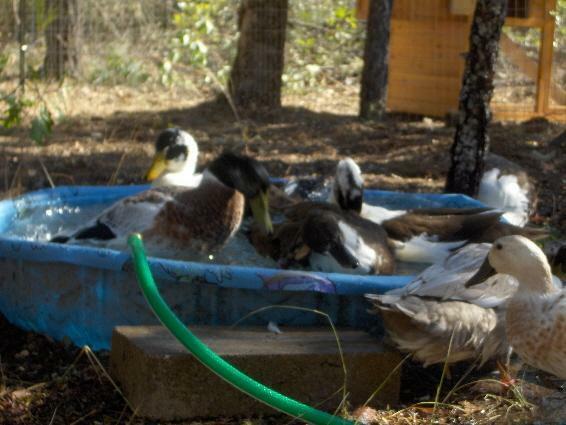 "Converted shed makes great duck house"
Great recycle tips and instructions for modifying a purchased shed for his ducks. Good suggestions for use of materials to improve the facility and make it nice looking too. I enjoyed his explanation for food storage, water barrier and electric usage. 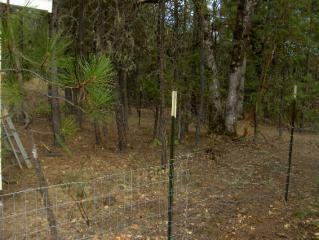 Predator proofing was good too. I really like how you divided the inside up.